There are few precious metal products on the market as intriguing and unique as those produced by the Atlantis Mint. Specializing in silver precious metals, Atlantis prides itself in hand pouring all of its silver bars, giving each one a sense of individuality in its finish. Today, the 1 oz Silver Atlantis Mint Hand Poured Skull Bar is available for purchase online courtesy of Silver.com. One of three new bars from Atlantis Mint! Ships in a plastic sleeve to protect the bar’s condition. Obverse replicates the image of a human skull. Reverse is flat and bears only engravings of the bar’s weight and purity. Hand-poured. Produced by a private American mint. Silver precious metal products are in high demand, and among those that are preferred by investors and collectors alike are the one-of-a-kind products. Any hand-poured bar is unique because the finish and appearance of each has subtle differences. On top of that, hand-poured production results in a bar with a traditional look and feel. 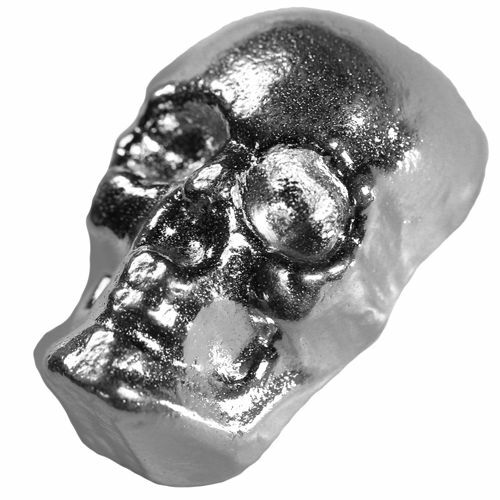 The human skull is the inspiration for the 1 oz Silver Atlantis Mint Hand Poured Skull Bar. The skull is one of the most vital parts of the human body, providing the supporting structure for the face and providing a protective cavity for the brain. 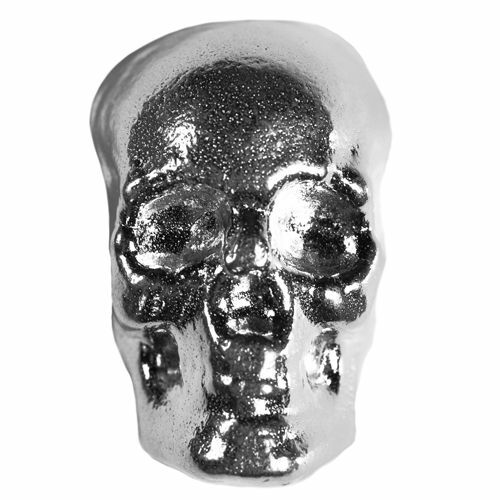 On the obverse of the 1 oz Silver Atlantis Mint Hand Poured Skull Bar is the 3D impression of a skull. The skull bar appears as a human skull would look stripped of flesh, with the teeth and mandible visible, the nasal cavity exposed, and the eye sockets hauntingly empty. Atlantis Mint both sells sovereign coins and silver rounds as an authorized dealer, and produces its own lineup of silver bars. The mint specializes in the production of silver products, and hand pours all of its own bar designs. Among the popular options are the ½ oz. Silver Alien Skull, and many others. If you have any questions, please don’t hesitate to contact Silver.com. Our customer service representatives are available on the phone at 888-989-7223. You can also connect with us online using our live web chat and our email address.